President Donald Trump Tuesday told supporters that he had told the Saudi monarch Salman he would not stay in power for two weeks without America’s protection and that he should pay. “We protect Saudi Arabia. Would you say they’re rich. And I love the King, King Salman. But I said ‘King – we’re protecting you – you might not be there for two weeks without us – you have to pay for your military,’” Trump said to cheers at a rally in Southaven, Mississippi. The remarks came following a Saturday phone call between the two allies. The two leaders, according to Saudi state-owned news agency SPA, discussed efforts being made to maintain supplies to ensure oil market stability and global economic growth. Trump’s comments are expected not to may irk the kingdom which relies on the U.S to counter its regional arch foe Iran. The kingdom last year in May was pleased to be the country chosen by Trump for his maiden foreign tour. Trump also withdrew from the 2015 nuclear accord between Iran and world leaders, to the satisfaction of Saudi Arabia, which has been opposed to the deal it viewed as a world stage for Iran. 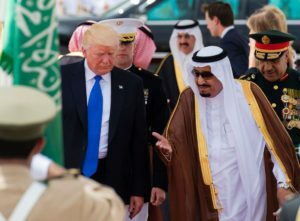 Trump has slammed Arab allies over poor contribution in keeping Iran and terror groups at bay in the region. His administration is currently pushing for the formation of an Arab ‘NATO’ with the aim of curbing Iran’s influence in region. Posted by KanelkaTagba on Oct 3 2018. Filed under Gulf News, Headlines. You can follow any responses to this entry through the RSS 2.0. Both comments and pings are currently closed.